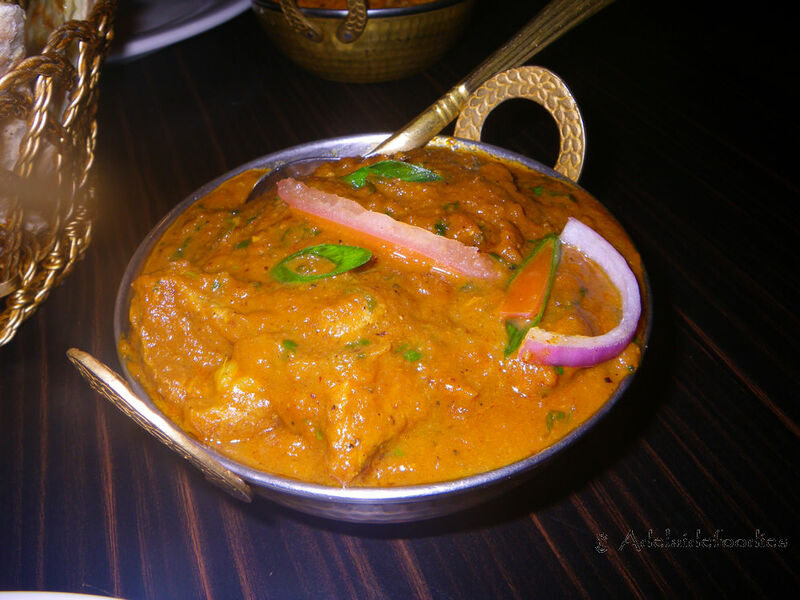 In recent years, Adelaide has got a full boost of Indian restaurants both in the city and in suburbs and most of them are Southern Indian cuisines, ie what we normally see as Indian food. 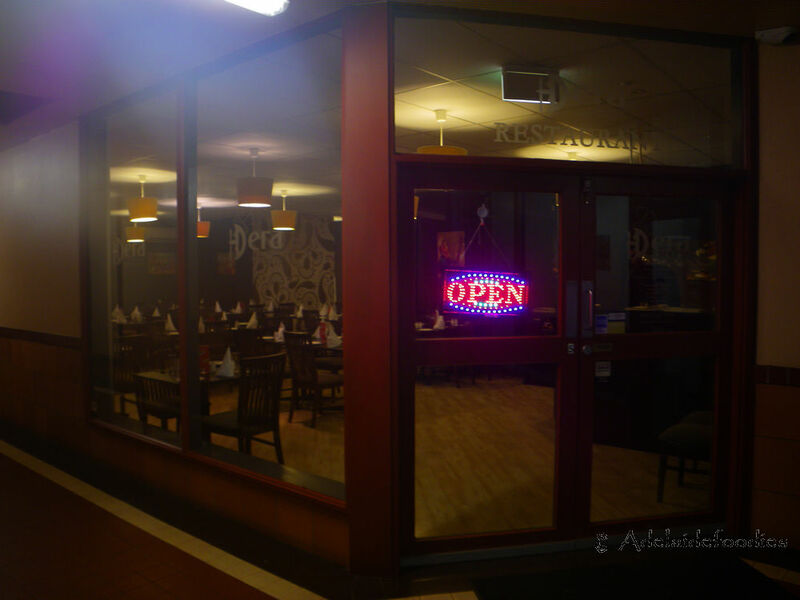 Back in 2003, when I was still in high school, there were only a couple of Indian restaurants in Adelaide. Although the old ones are still in town, the amount of customers are not as good as what it was like 10 years ago. Anyway, during a recent trip down grange road, Tina and I found ourselves a nice little Northern Indian restaurant. Compared to the southern version of the cuisine, northern dishes focus more on the strong flavours of curries which are also much thicker. 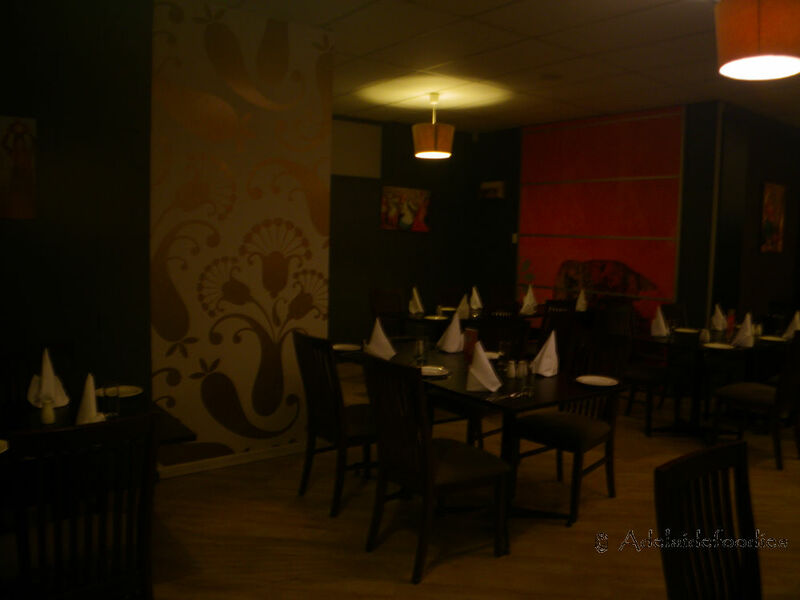 The interior of the restaurant was simple but elegant. With a special focus the traditional colors of India, diners can have a real feel of the one of the oldest civilizations in the world. The restaurant had two sides, one being the main restaurant and the other being the pickup area with a sofa for customers to rest. With musics on all night, the restaurant created a relaxed yet comfortable environment for a casual night out. 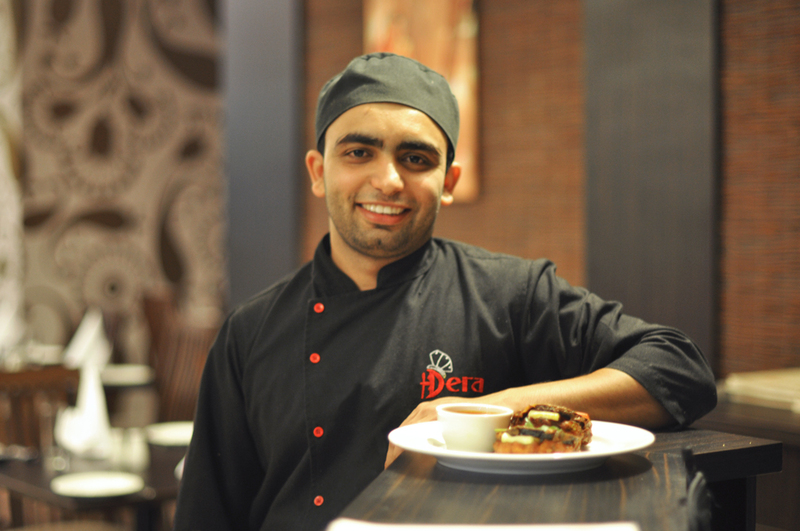 Opened in 2011, Dera means birds’ nest and according to the manager of the restaurant, the owner wanted to create a family and home feel for diners so they could enjoy their dinner while feeling the kindness Indian people wanted to pass on. Being a finalist for Messenger Local Business Award in 2011 for formal dining, the restaurant must be doing something right to attract attentions. For the night we were there, the customer flow was good even before 7 pm, considering it was a Wednesday. 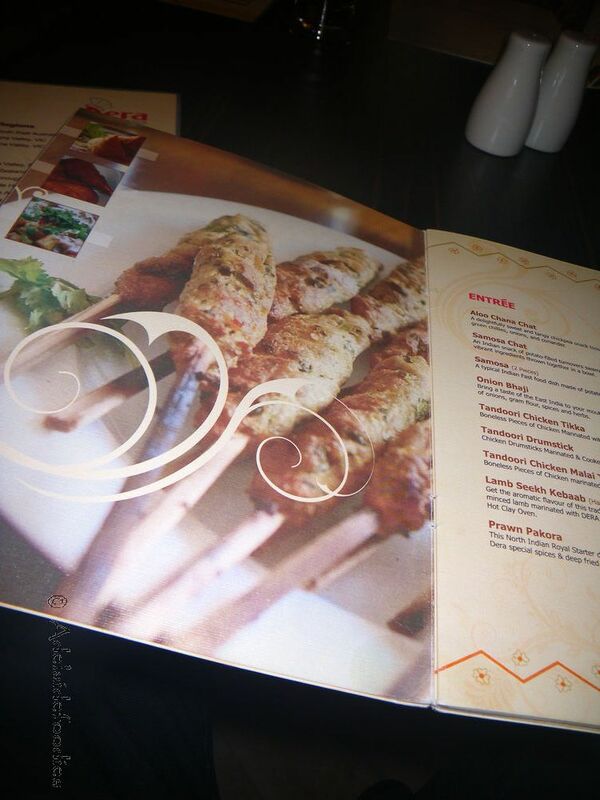 The menu of Dera contained an extensive amount of traditional and modern northern Indian dishes. 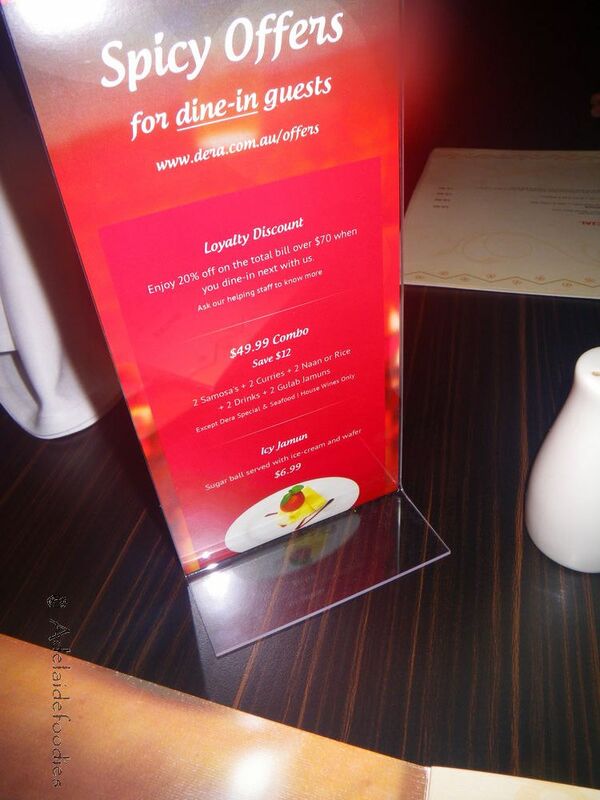 The prices are pretty affordable with most of their mains being around $16 and their specialty dishes just below $20. Later on you will see the large serves and two courses filled Tina and me really up to the throat :). The restaurant has different offers throughout the year and they are currently trialing to create fusion dishes to showcase how Indian cuisines can contribute to and be a part of modern Australian cuisine. The headchef of the restaurant, Jaswinder Singh said he would love to invest his time and cooking techniques to merge some of the best Indian dishes into local cuisines using fresh local produce so that diners could experience something different from other Indian restaurants. Once seated, we were kindly welcomed and got our order sorted. 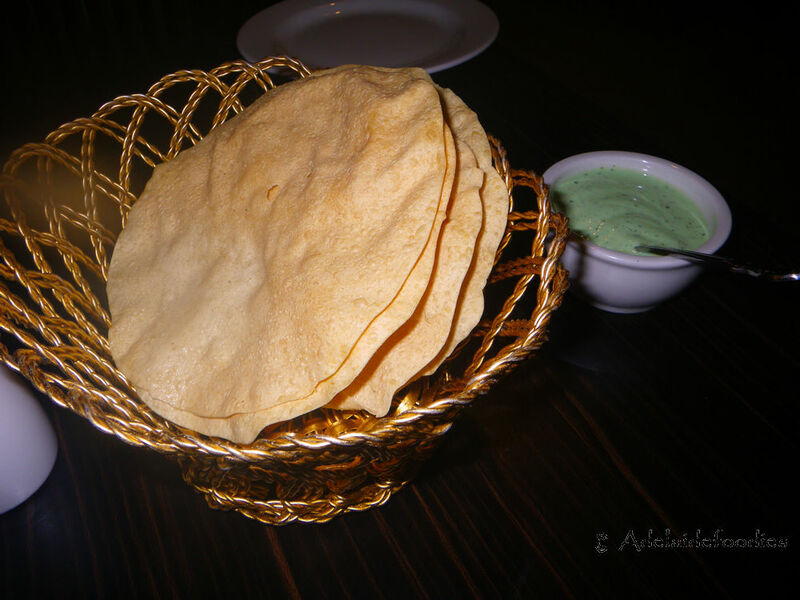 In most of the Indian restaurants, papadum is a must, so does for Dera. If you have never tasted papadum before, they are crispy and have a distinctive flavour of cumin and other spices. What we liked the papadum at Dera was the complementary mint sauce, which significantly reduced the oiliness of the papadum and cleansed the palate between courses. For entrees, we ordered two hot plate dishes. 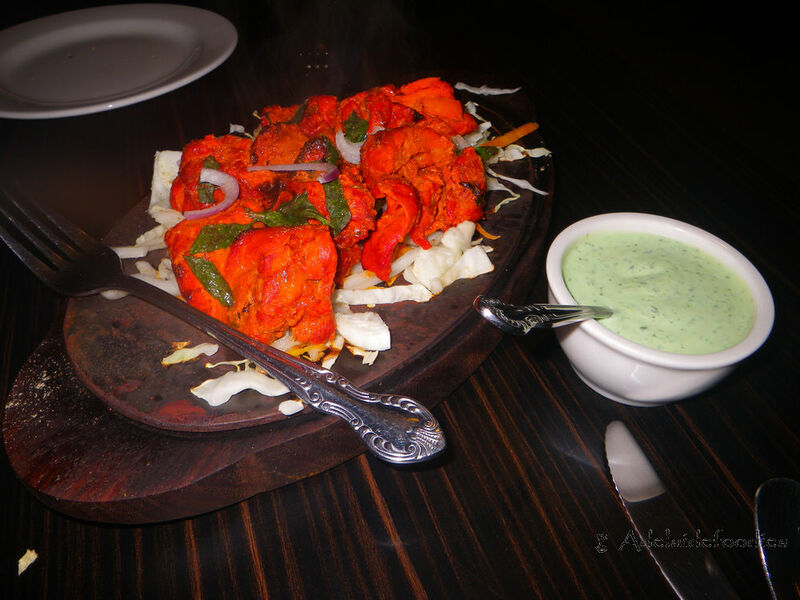 The chicken tikka dish was made of boneless chicken pieces which were marinated in a special sauce of the restaurant. It was then cooked continuously in a tandoor until the color of the meat turned red. Taste-wise, the smoky aroma of the tandoor has been fully spread into the meat and made the bites fun filled especially with the tender and moist chicken pieces. The mint sauce served the dish well while it is obvious how big the serve of their entree is. Lamb kebabs are best known for their juiciness and this dish exhibits many good aspects. The lamb was marinated with Dera’s special sauce and was seasoned well. The smokiness that transferred from the meat to the mouth indicated that they must have been roasted in clay ovens. 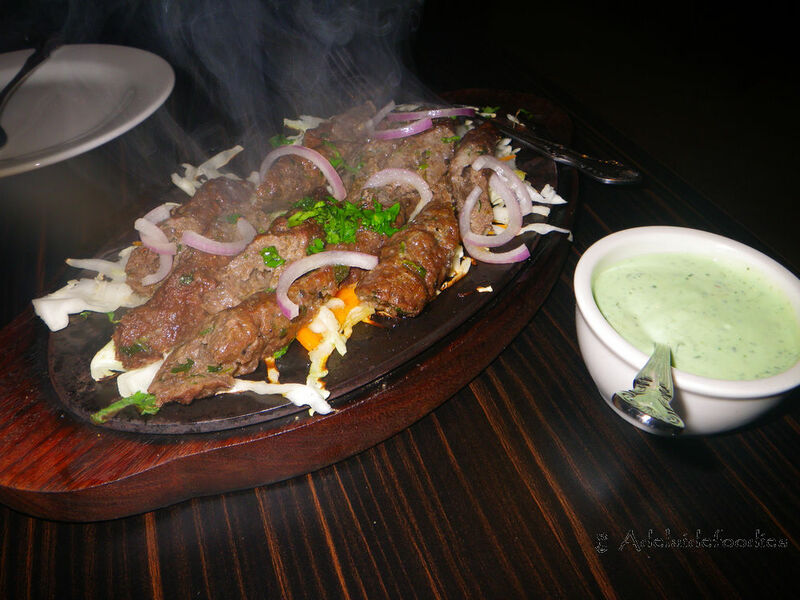 The meat was very tender and delicious while cutting the meat caused some juices running out of the kebab. I tried to put a whole piece in my mouth and it released plenty of liquid onto the palate. The lamb flavour has been covered by plenty of spices and the meat was full of aromatic smells and taste. 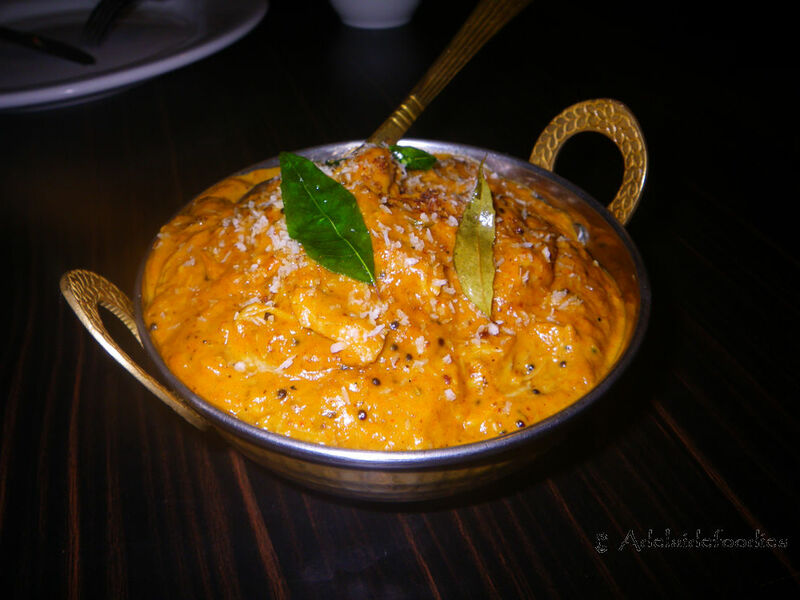 For mains, we decided to go for two Dera’s Specials to see what the restaurant does best. This is a dish that I saw the true character of Dera. The chicken was presented in big cubes and in shredded pieces, both of which were cooked in Tamil Nadu, an Indian state, style. The dish was moderately hot to me but did not have any chilli flavour. The hotness of the dish was in fact caused by the black mustard seeds as shown in the above photo. The curry sauce was creamy and very tasty, making the dish suitable to be enjoyed with some Indian rice or Naan. Recommended! Goat curry is always my preference whenever going to an Indian or Nepalese restaurant. This is a North Indian dish and the goat was cooked on the bone with plenty of spices. It may be a bit saltier for you but after combining with garlic naan, the creaminess of the naan neutrailised with the salty flavour and made the dish very tasty. The goat pieces were tender and maintained the right amount of moisture in the meat while being cooked to perfection. All spicy flavours of the curry paste has gone fully into the goat meat and hence made this dish a very good goat curry to be enjoyed. 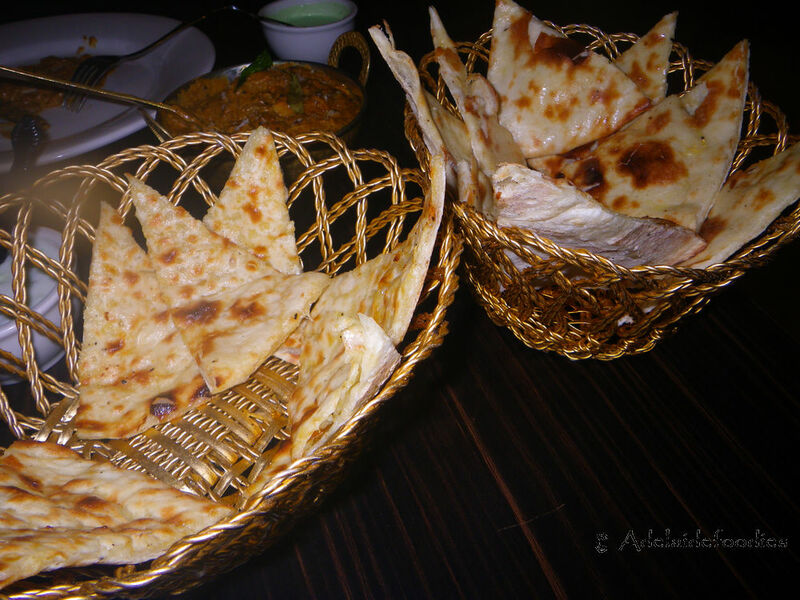 To accompany the above dishes, we ordered plain and garlic naans. Both of them went well with the dishes, but overall I preferred the crusty plain naan. Overall the service for the night was faultless and the waiters were welcoming with extensive knowledge in their own cuisine. The surrounding environment was nice and quiet. When their fusion cuisines are created, I will definitely return for another taste. 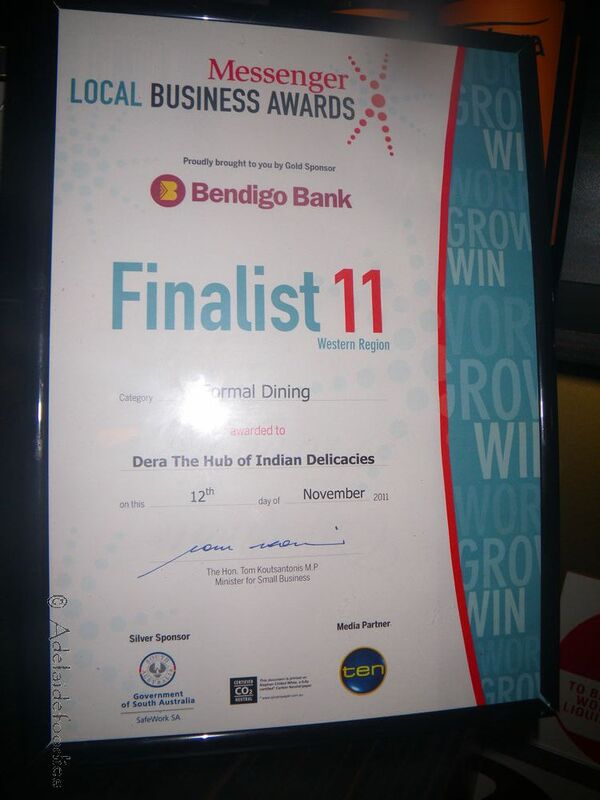 [Disclaimer] Adelaidefoodies were invited for dinner at Dera but all opinions are our own as always. The dishes sounds worth trying. Are they open for lunch? As Pushpinder said, they only open for dinner at the moment. Graeme, thanks for the comment and yes, we make each one of our dish fresh and on order using authentic ways. Would love you serve you again sometime – let us know when you want to come over. George, unfortunately we are a dinner only restaurant at the moment but planning for lunch as things progress. You are most welcome anytime! G’day! 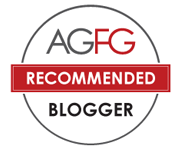 Great review Xin and the Chicken Chettinad looks right up my alley for heat and spice!